Hawk Ceramic Front Brake Pads 04-06 Dodge Ram SRT-10 Hawk Ceramic Front Brake Pads 04-06 Dodge Ram SRT-10, Hawk Front Brake Pads 04-06 Dodge Ram SRT-10, Ceramic Front Brake Pads Dodge Ram SRT-10, Front Brake Pads Dodge Ram SRT-10, Ceramic Front Brake Pads Ram SRT-10, Front Brake Pads Ram SRT-10, SRT10 Brake [Hawk HB299Z.650 Brake Pads] - $105.95 : 3rd Strike Performance, Your Source for Late Model MOPAR Performance Parts and Accessories! 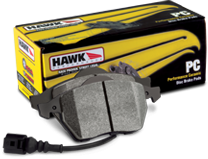 Hawk Performance ceramic brake pads are built with a premium, high performance, ultra-low dust, low-noise compound. They're engineered to reduce brake NVH (noise, vibration, and harshness), creating a quieter performing brake pad. Furthermore, the ceramic brake pad formula has a linear friction profile that allows your ABS brake system to work more effectively. With Performance Ceramic, you can expect reduced brake pad wear, lower dust output levels, and rotor-friendly brake pads.